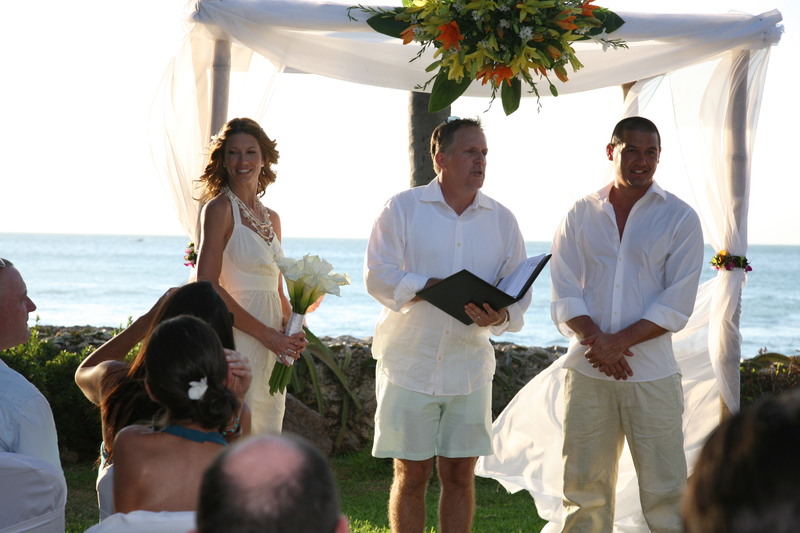 My husband and I just returned from our destination wedding in Tamarindo, Costa Rica. It was incredible and a forever memorable trip. Because we wanted to keep it affordable and started planning only about 3 months ahead of time we didn’t have a ton of options. Luckily we narrowed down our location to Costa Rica and fairly quickly found a resort that would work. 1) Paperless Post invites. Paperless Post lets you select and customize stationary and envelopes that you send via email. There is a small cost for the “stamps” but the cost is minimal compared to the cost of customizing, printing, and mailing paper invitations. And there is no waste! 2) Beef-free Buffet. We selected a resort that, while it didn’t have an eco-friendly rating despite the booming eco-tourism of Costa Rica (those we found that were eco-rated cost much more than our budget could afford and were all-inclusive, which wasn’t what we were going for). We were able to get a buffet menu and negotiated only to offer the amount of food per person rather than the minimum of 40 people (we only had 30). We also selected a menu of chicken and fish so we didn’t have the added carbon footprint of beef. 3) Local flowers. 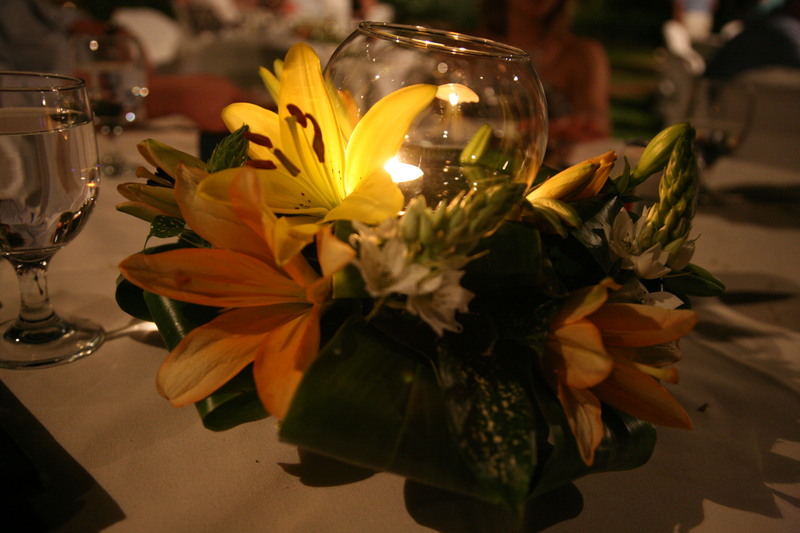 Our table decorations were very minimal and designed of only local tropical flowers, as were the flowers that decorated our cake. 4) Paper free. Despite having a reception in the garden right next to the beach, all of our serving ware was reusable with real plates, glasses, napkins and silver ware provided by the resort. We also went without programs. Some people may like the keepsakes, but we provided a very memorable experience for our guests without producing any additional waste, much of which would have likely blown into the ocean. 5) Walkable location. None of our guests needed a car. They were able to take shuttles from the Liberia Airport to the resort and Tamarindo and walk around town or take group shuttles to nearby activities. 6) BYO-Water Bottle. People may think this is just one more thing to remember on a trip, but on recent plane travel I have been bringing my own reusable water bottle. I keep it empty through security so it is not confiscated, and then on the plane have them fill it up with water so that I don’t waste a plastic cup and ensure I get more H20 to keep hydrated. We had a perfect wedding, with the ocean in the background, all for under $4000 ($3000 more for total travel, hotel, meals, and transportation to and from airport, so about $7000 all said and done). A few green practices and some thrifty planning helped us have a wedding that had minimal environmental impact (airplane travel was the biggest impact for which we purchased carbon offsets for our travel) all for an incredibly affordable price by U.S. standards (I recently read that the average U.S. weddings costs $25,000 and D.C. – where we live – averages $45,000). Adopting a few eco-practices can help you be green and save green, while still having a wedding celebration that is every bit as memorable for you and your guests as one that costs thousands more.